England boss Roy Hodgson has shrugged off Adnan Januzaj's decision to play international football for Belgium. 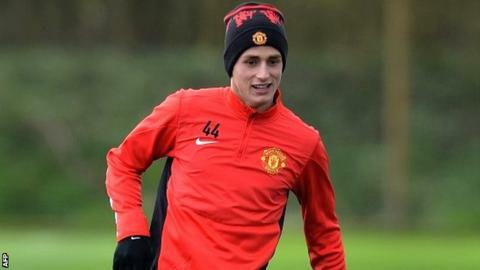 The 19-year-old was born in Brussels to Kosovan-Albanian parents and joined Manchester United in 2011. Januzaj would have been available for England on residency grounds in 2018 if he had not played in a competitive game for another nation. "How can you be upset if he plays for one of the other countries that he's actually eligible for?" said Hodgson. Fifa rules state a player is eligible if "he has lived continuously for at least five years after reaching the age of 18 on the territory of the relevant association". Hodgson adedd: "If a player isn't eligible to play for England until 2018, then what's the problem if he goes and plays for someone else? He's not English anyway - let's be fair." "I don't see what the fuss is about. He was born and brought up in Belgium. We can't be disappointed by that." How do we define Englishness? Read more on Jack Wilshere row: How do we define Englishness?